For decades, the overwhelming majority of population and economic growth has occurred in the Sun Belt – the nation’s South and West as defined by the United States Bureau of the Census. This broadly-defined area stretches south from the Washington-Baltimore area to the entire West, including anything but sunny Seattle and Portland. Any list of population growth or employment growth among the major metropolitan areas will tend to show the Sun Belt metropolitan areas bunched at the top and the Frost Belt areas (the Northeast and Midwest regions) bunched at the bottom. Since World War II, no state has experienced the growth that has occurred in California. However, the trends in the last decade indicate a shift, certainly away from California, which has experienced a net domestic migration (people moving to other parts of the nation). The overall loss reaches over 1.2 million people; the state’s overall population growth rate is now only little more than average. Some metropolitan areas in the Frost Belt have begun to perform better in population and domestic migration, but most continue to experience growth that is well below that of the Sun Belt. The exception to this is Indianapolis, which has developed growth rates that would put it right in the middle of Sun Belt metropolitan areas, if it were not in the Frost Belt. Indianapolis is a metropolitan area of 1.7 million population. Indianapolis added nearly 11 percent to its population between 2000 and 2007 (latest data available) and ranks 19th in population growth among the 50 metropolitan areas with more than 1,000,000 population (New Orleans has been excluded from this analysis because of the hurricane related population losses). Indianapolis is growing faster than Washington, DC or Seattle and nearly as fast as Portland or Denver. Its population growth rate has been double that of San Diego, triple that of Los Angeles or San Jose and more than six times that of San Francisco, which has seen its growth slow to a rate no better than that of Italy. Overall Indianapolis would rank 18th out of the 32 largest US Sun Belt metropolitan areas in total population growth. It is the fastest growing of the 18 largest Frost Belt metropolitan areas. Between 2000 and 2007, the Indianapolis metropolitan area added 55,000 domestic migrants, equal to 3.6 percent of its 2000 population. No other Frost Belt metropolitan area comes close. Columbus and Kansas City had domestic migration gains, at 1.2 percent of their population. All other Frost Belt metropolitan areas lost domestic migrants. Indianapolis, however, would have ranked 17th out of the 32 largest Sun Belt metropolitan areas trailing Portland, but leading Seattle and Denver. The distribution of domestic migration within the Indianapolis metropolitan area is also significant. For one-half century various analysts have predicted the decline of the suburbs. Indianapolis, like most metropolitan areas around the country, shows exactly the opposite: the suburbs continue to attract central city residents and have yet to fall into this seemingly inevitable decline. While the Indianapolis metropolitan area gained 55,000 domestic migrants from 2000 to 2007, Marion County, the central county which is nearly co-existent with the central city of Indianapolis, lost 46,500 domestic migrants. All of the domestic migration growth was in the suburbs, which attracted 101,800 new residents from Indianapolis/Marion County and the rest of the nation. What is it that has allowed Indianapolis to experience Sun Belt growth despite being in the Frost Belt? This is not the place for a full attempt to identify all of the causes, but some observations can be made. Perhaps it is most important to understand what is not the cause of the superior growth in Indianapolis. It is not the city’s “unigov” governance structure. In the early 1970s, to the great fanfare of urban planners, Indianapolis merged with most of Marion County, increasing the city’s population by approximately 50 percent. Proponents of local government consolidations often (and speciously) suggest that these consolidations will make metropolitan areas more attractive (this issue is discussed in detail in our Pennsylvania report on local government consolidation). Yet, Indianapolis, one of the nation’s largest consolidated local governments, is losing residents to the suburbs. It is also worthy of note that state taxpayers provided a $1 billion pension bailout to the city last year. One factor that clearly makes Indianapolis attractive is its housing affordability, which is the best among metropolitan areas with more than 1,000,000 residents in six nations. According to our 5th Annual Demographia International Housing Affordability Survey, Indianapolis had a Median Multiple (median house price divided by median household income) of 2.2 in the third quarter of 2008, well below the historic norm of 3.0. Indianapolis has been ranked near the top in each of the preceding four editions as well. In recent years, new suburban starter houses of 1,500 square feet have been advertised at less than $110,000, less than the price of land for a house in many metropolitan areas. Superior housing affordability constitutes a critical important attractor. At the height of the housing bubble, a household living in the median priced house in Indianapolis would have saved more than $1,000,000 in down payment and mortgage payments over 30 years, compared to San Diego. 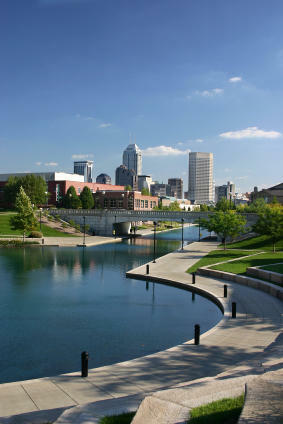 Indianapolis also has the advantage of a comfortable lifestyle. Commuters spend 2 minutes less per day than the national average getting to work, according to the 2007 United States Bureau of the Census American Community Survey. The Texas Transportation Institute indicates that traffic congestion is less severe in Indianapolis than average and that it has become better in the last 10 years. Indicating its usual irrelevance to traffic congestion, Indianapolis has the smallest transit market share of any urban area over 1,000,000 in the nation, at approximately 0.2 percent. This compares to 11 percent in New York, 5 percent in San Francisco and 2 percent in Los Angeles and Portland. Where does Indianapolis go from here? So far, Indianapolis has shown resiliency in the current economic crisis. The December 2009 unemployment rate was 6.7 percent, which is below the 7.2 percent national rate. Other parts of Indiana are not doing nearly as well, especially in smaller metropolitan areas that rely to a greater extent on manufacturing. For example, unemployment has reached 15 percent in Elkhart. To some extent, the metropolitan area’s huge advantage in housing affordability has been eroded by the collapse of prices in the most expensive Sun Belt metropolitan areas, such as in California and Florida. Yet, Indianapolis remains far more affordable, even after these losses. Indianapolis also has an advantages for business. In the State Business Tax Climate Index, Indiana is ranked highly, at 14th in the nation. With the prospect of higher taxes, both at the federal level and in many states, this should help Indianapolis retain an impressive advantage and continue to perform as if it were a Sun Belt metropolitan area, but without the problems associated with the housing bubble, massive congestions and growing social inequality. Submitted by abhkr4455 on Thu, 05/07/2015 - 02:41. Submitted by arrharish250 on Sat, 05/23/2015 - 08:47. Submitted by anderjokeik on Wed, 05/13/2015 - 06:31. Submitted by abhkr4455 on Thu, 05/07/2015 - 02:40. Submitted by abhkr4455 on Thu, 05/07/2015 - 02:39. Submitted by abhkr4455 on Thu, 05/07/2015 - 02:38. Submitted by fatahiqbal on Wed, 04/22/2015 - 04:48.
without the problems associated with the housing bubble, massive congestions and growing social inequality. Submitted by CaitliMie on Mon, 01/26/2015 - 05:51. Indianapolis has been ranked near the top in each of the preceding four editions as well. In recent years, new suburban starter houses of 1,500 square feet have been advertised at less than $110,000, less than the price of land for a house in many metropolitan areas. Submitted by uofix on Sat, 09/13/2014 - 07:44. Submitted by uvcfg on Sat, 08/30/2014 - 08:39.